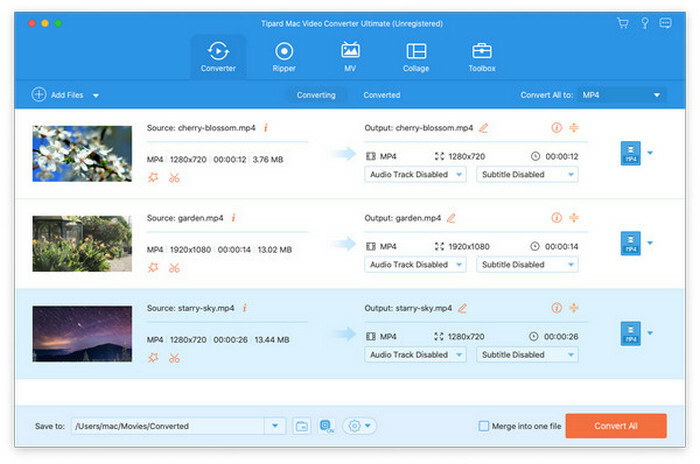 Tipard Mac Video Converter Ultimate allows you to convert your video to MP4, MOV, AVI and any other formats. We also added a new editing function which enables you to improve video quality greatly by enhancing video resolution and reducing shacking video. You could also rotate or clip video freely in order to meet your needs. Tipard Mac Video Converter Ultimate helps convert any video to other formats like MP4, MOV, AVI and more so that you could watch your videos on different devices. Before your conversion, you could edit video effects. We also added a new editing function which enables you to improve video quality greatly by enhancing video resolution and reducing shacking video. You could also rotate or clip video freely in order to meet your needs. It is made to convert homemade DVD and any other video to MP4, AVI, MOV, MKV, etc. You could also convert your 4K video to other 360p, 720p, 1080p video. You are also allowed to convert music video to any audio formats such as MP3, AAC, AC3 and OGG. You can rotate the video to the correct angle and enhance the video by upscaling resolution, optimizing brightness and contrast, removing video noise and reducing video shaking, all of them could let you enjoy a high quality video. Before converting your video, you are also able to edit your video as you like, such as cropping the video area size, converting 2D to 3D, adding watermark and adjusting the video effect. This software is compatiable with iPhone, iPad, iPod and Samsung, HTC, PS3, Xbox and more mobile devices, as a result, you can play any of your videos with the supported formats and enjoy them freely.